Not a sketch or a painting yet, however kind of cool anyway. 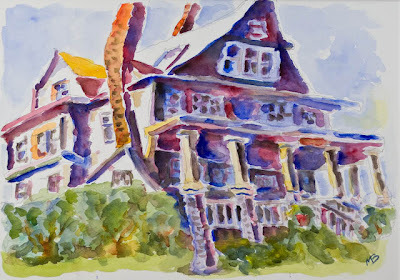 This is the fifth watercolor in a series on local landmarks. My plan is to package all five as a set of notecards. This is the famous Whiteside Theatre in Corvallis. It is presently awaiting renovation. Last night was Open Studio Night at OSU. One of our favorite models, Laura (in preparation for Halloween) decided to wear her old punk outfit. 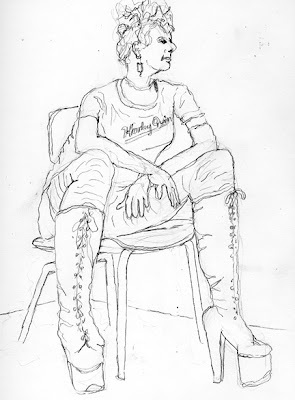 I made a couple of contour drawings which I hope will eventually become watercolor paintings. It was much more impressive in bright red and black, along with her 6 inch heels. 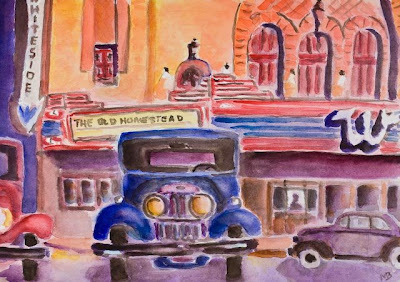 This was my first decent attempt at a Charles Reid style watercolor. Of course I took the liberty of adding the architectural caricature in order to add interest. This was also my first use of the Guerilla Painter Watercolorboard that I recently bought. This device stretches the wet paper and adds the raised deckle edges. I now have to figure out how to frame it so that the print does not touch the glazing. I had previously been allowed to go into the attic of this 1860s building that is now the home of the Benton County Historical Society. The second image is a photoshop manipulated image inside the attic. 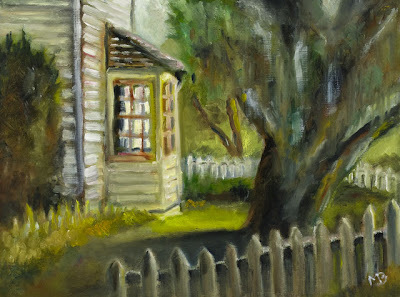 Wednesday was one of the last plein air trips for the season and we went to Fort Hoskins. Unfortunately there was no fort, however there was a large field of apple trees to paint. I started this oil on site but the sun was too bright and I had to finish it later. 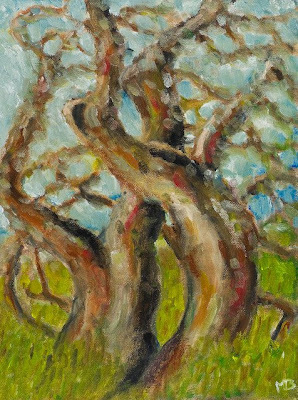 I think I am starting to get the difference between real oil painting versus coloring canvas with oil. What do you think? I got a bit carried away with my watercolors however it was fun. 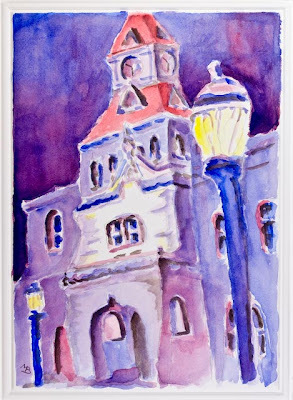 This is a caricature of our Arts Center which is located near Central Park in the heart of Corvallis. 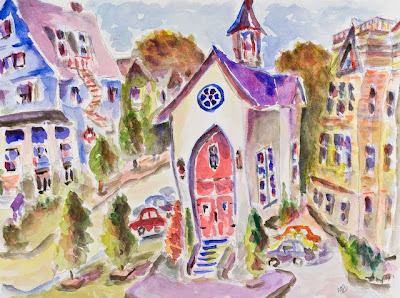 The Arts Center used to be a church and is near the Disciples House. 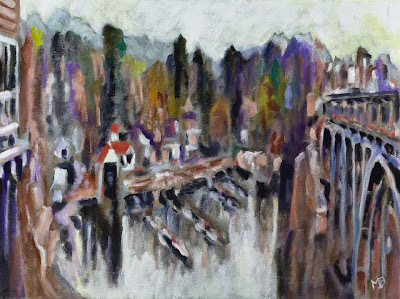 I just had to do more paintings at Depot Bay. 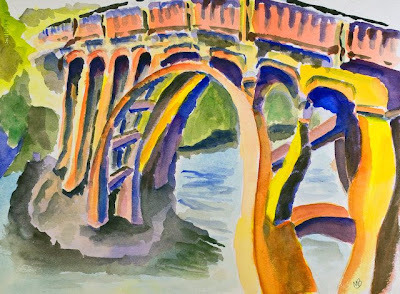 The first is a caricature of the bridge in watercolor. 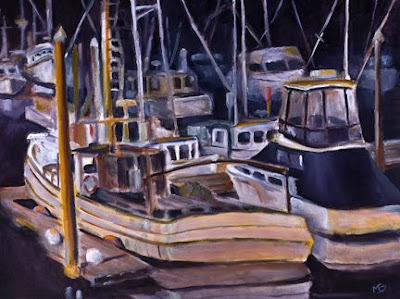 The second is an oil painting of the entire bay, 180 degrees, compressed into my usual 12X16 format. It clearly demonstrates that this is indeed the smallest harbor in the world. 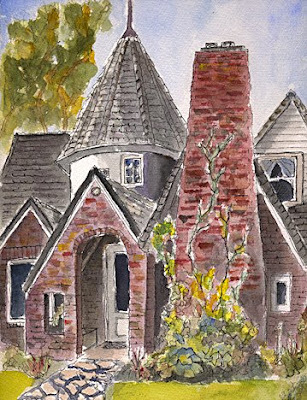 I have been wanting to draw a caricature of the Disciples House in Corvallis for some time. This is the result. 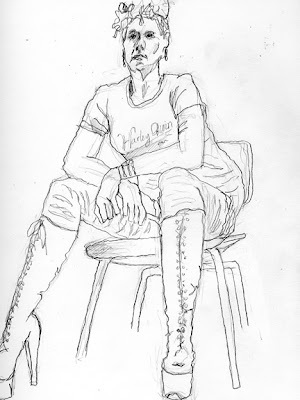 Initially I did a pencil sketch and followed this with ink and felt pen for values. 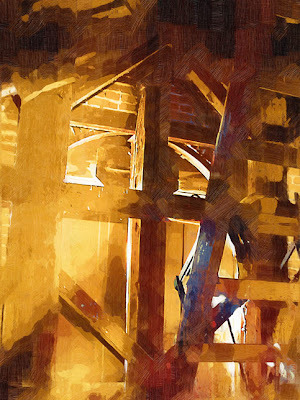 "It speaks to what discipleship in the 21st century is actually like: contrasting values with lots of grey areas, challenged foundations, obscured windows, circuitous paths for venting fire, and wonky but lovable structure integrity." That's exactly what I had in mind (I wish). 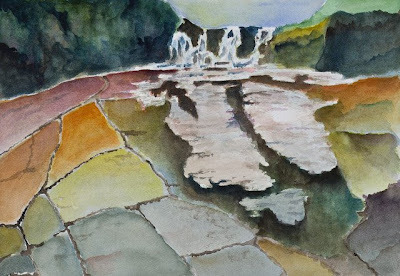 Wednesday our painting group went to Alsea Falls which is SW of Corvallis. 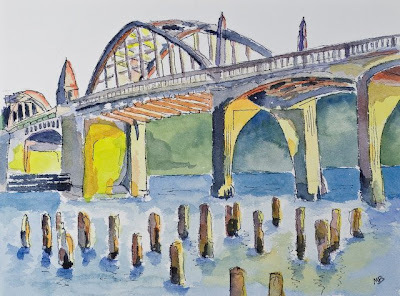 It was foggy and wet in the morning so painting was difficult, however we did encounter another plein air painting group from Eugene and they joined us for the critique. It is amazing that we had not heard about them before since they are large (about 150 members) and have been doing this for a long time. 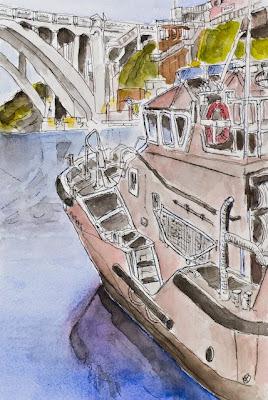 I made this watercolor later at home from my sketches and photos. 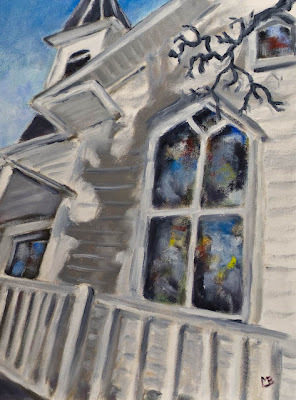 Our Vistas & Vineyard outing last wednesday in Philomath was cancelled due to rain (as amazing as it may seem for Oregon) so I painted the Philomath Community Church from a photo that I took previously. 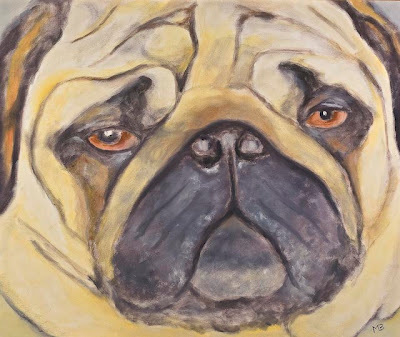 I am still using water soluble oil however I do plan to also use regular oil again in the near future for work in my studio. I also plan to paint this same image in watercolor. Thank you Deb for my nomination for the Blog Award! Right click on the award to save it to your computer. Then you can insert it into your blog. 5. Leave a message for you nominees on their blogs. The following are two paintings from a workshop last week at Tyee Vineyards in Philomath. 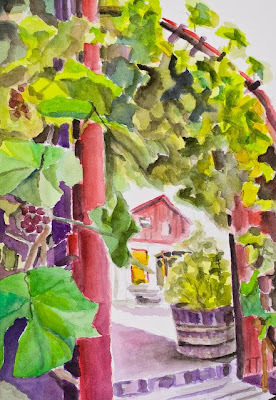 The first is a view through a grape arbor at the tasting room. The second is an oil of a dead Tractorsaurus Hex. I still can't decide whether I prefer oil or watercolor. Today we visited the Greengable Gardens in Philomath. 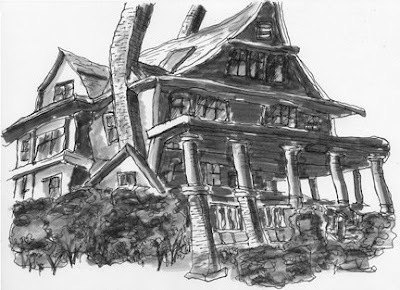 I did an ink drawing of the Greengable Garden House to which I later added watercolor. The house was built in the 1920's in the 20th century Norman Farmhouse architecture, based on a danish style. I think the first owner must have been a smurf. 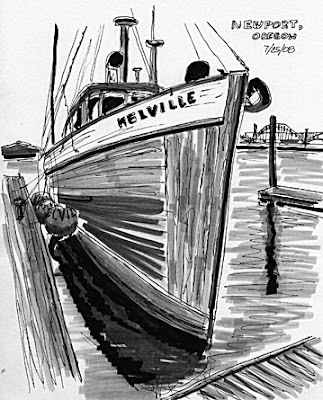 Previously most of my sketches were done with an extra fine point ink pen. I was never very successful with adding hatch marks and as a result they lacked contrast. So I am now trying to add values with a set of Tombow pens. 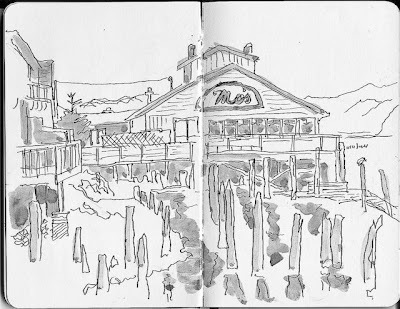 This sketch is from a trip we took yesterday to Newport on the Oregon coast. After letting Sophie, our golden retriever, chase balls on the beach, we stopped at fisherman's wharf where I spotted this majestic looking fishing boat. In the background is the Yaquina Bay Bridge. I like this style better. 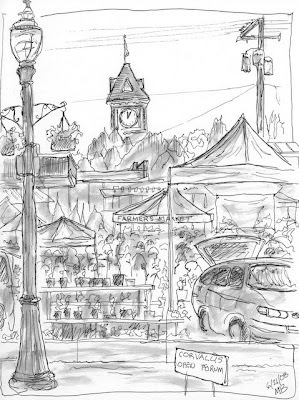 Every year in July, Corvallis sponsors daVinci Days. This event includes art, music, contests, exhibits and many hands on activities plus a race with human-powered, all-terrain, road-worthy , mud and water slogging, kinetic vehicles. At the Art Center's Art Guild booth we had a live model for artists to paint or draw as well as an activity called the "daVinci Draw" where young and old had the opportunity to test their drawing ability. We used the exercise from Betty Edward's book in which they replicated a line drawing of the Mona Lisa upside down. Some of the resulting drawings were quite good. 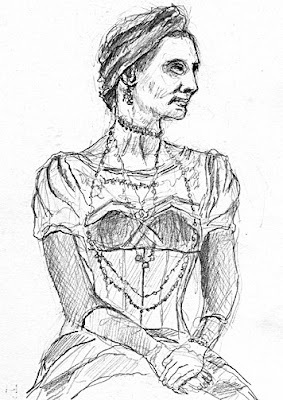 On the first day I decided to do a drawing of our model who was wearing a period outfit. She modeled for the entire two day event. 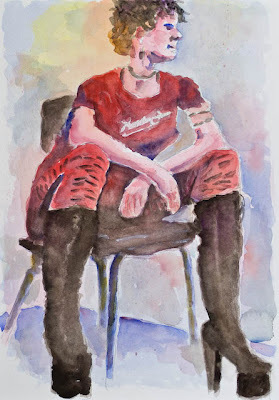 On the second day she changed outfits and I did the oil portrait. 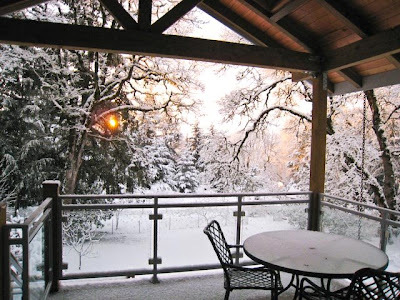 This weeks Vistas & Vineyards destination was Brownsville, Oregon just off of I5. 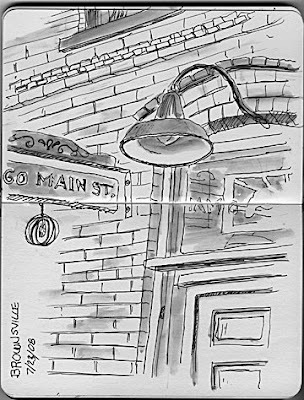 Most of us painted and sketched Main Street. At the end of the street is Carlson's Hardware Store which was the first brick building built here in 1903. It is an iron front building and has always been a hardware store with the Masonic lodge upstairs. Today my challenge was to paint oak trees dancing because our painting group visited the Dancing Oaks Nursery. I used my new water soluble oils. About 20 people were in the group but no one else chose this subject. Let me know how I could improve this? I was hoping to show more motion in the branches without creating a major mess. 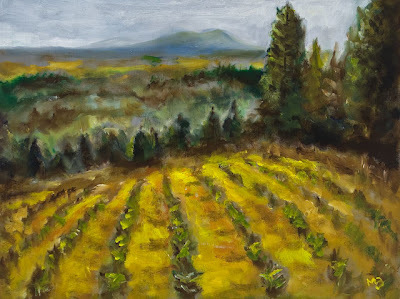 These are my latest oil paintings from recent Vistas & Vineyard outings. The first one is of a tree farm south of Philomath, OR. I painted it with regular oil paint. The second one was of the Fiechter House (1857) at the Finley National Wildlife Refuge. 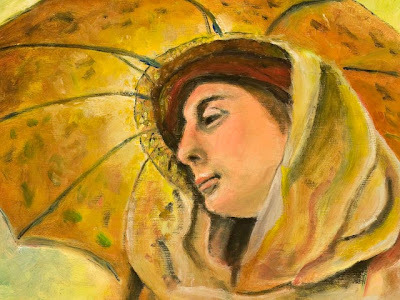 Both were painted on doorskins coated with Shellac and then Gesso, however the second one was painted with Holbein water soluble oil paints. I may just be a convert since it is far safer and less messy than traditional oil. I am still trying to master watercolor so I made a couple of watercolor sketches. On top is the caretakers house at Haceta Head with the Cape Creek bridge in the background. The house in now a fancy B&B. The sketch below it is the Florence bridge again. On top is the bridge looking west from a small park in Florence. The bottom sketch is the view looking east from the same spot. This is the famous Mo's Restaurant known primarily for their clam chowder. 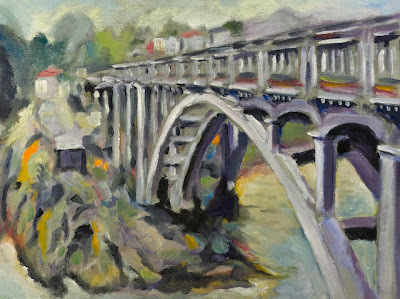 This is another oil painting of the understructure of the bridge in Florence. 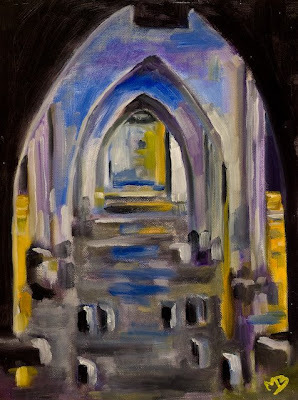 I seem to be attracted to the yellow/violet-orange/blue crossed complements lately, or else I just wanted to use up my palette. 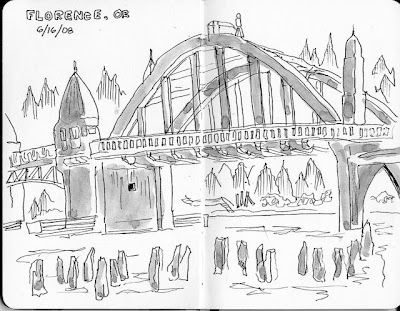 I'll also show some sketches of the entire bridge from my Moleskine sketchbook that I recently started. 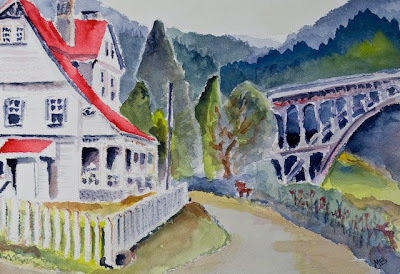 Every year V&V takes a two or three day painting trip to some destination in Oregon. 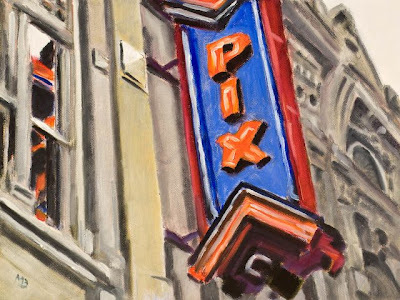 This year about 20 of us went to Florence where we were joined by a few other painters from similar groups in other Oregon locations. Haceta Head is a bit north of Florence and I have visited here many times in the past. This year I made this oil painting looking right up at the lighthouse. 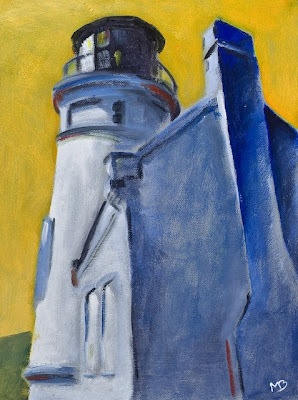 Many of the paintings on this day included the lighthouse. 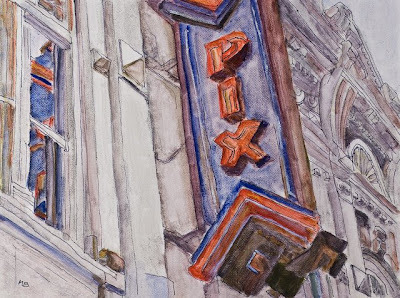 This view of the old Pix Theater was from another Wednesday outing with Vistas & Vineyards. 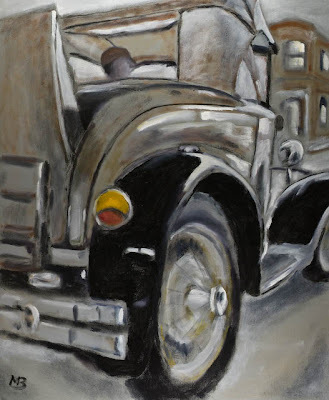 Again I tried to replicate a watercolor wash but using oil paint over an ink wash on canvas board. 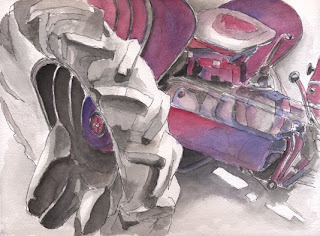 I am thinking that watercolor might be a better medium for this technique. I spent more that an hour standing in the street making the original sketch. For the final sketch I used some photographs as a reference. 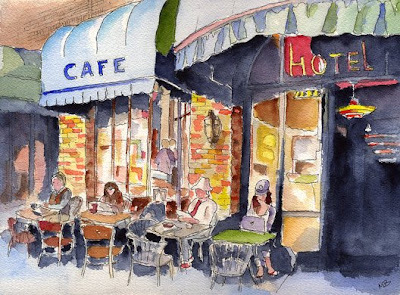 This is my latest watercolor and is based on a photograph I recently took on a trip to Berkeley, Calif. It is the French Hotel which is a small quaint place close to the UC Campus. I passed it every day on my way to school in the 1960's and never noticed it. Painting forces one to see things one would overlook otherwise. I used very little water for this piece in order to achieve the bright colors. 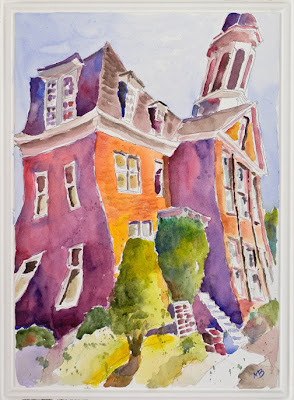 I am trying to learn the style of Charles Reid, one of my favorite contemporary painters. I like it so I will probably focus on watercolor this summer. This is Pong MD. MD stands for "My Dog". I made this oil painting a few months ago and it now hangs in our family room . 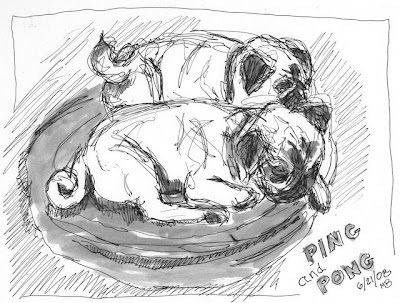 We have two pugs, Ping and Pong, and they both find their way in many of my sketches. The original oil is 20X24 inches, the original Pong is only about 5X6 inches. Pong is only intimidated a little by his portrait. This is a painting I did a couple of weeks ago. 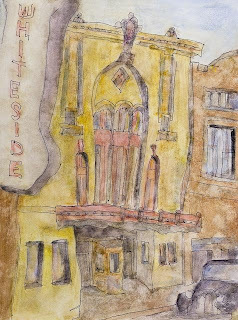 It is of the historic Whiteside Theatre and is based on an old photo from the county historic archives. As an experiment I began with an exaggerated ink sketch using a Sharpie extra fine pen on a canvas board. I used a Sharpie because it is permanent from both water and mineral spirits. Then I used light washes of oil paint to add color in such a way that the ink is still visible. I blotched the paint with a paper towel to increase the funky effect. The idea was to be able to frame the piece without glass as an oil painting. 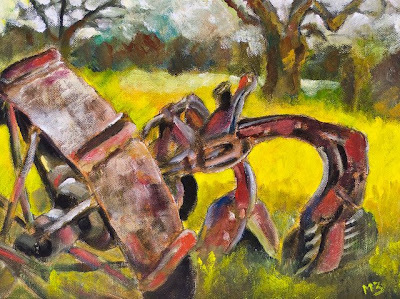 I just completed the watercolor of the dead tractor from the Garden of the Woods. The tractor has seen better days as you can see from the tube hanging out of the tire rim. This is the first watercolor painting in about a year. However it is more of an illustration, but I like the style. 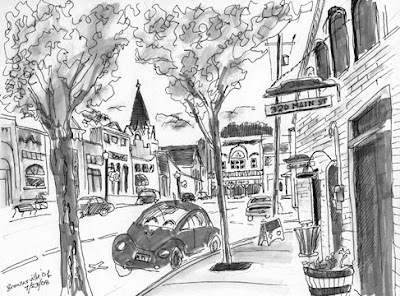 Based on a photograph I took, I used light pencil and then my pen to make the sketch on 140 CP Arches Watercolor paper. I will be doing more of this style in the future. This past Wednesday our Vistas & Vineyards group visited Garden of the Woods. 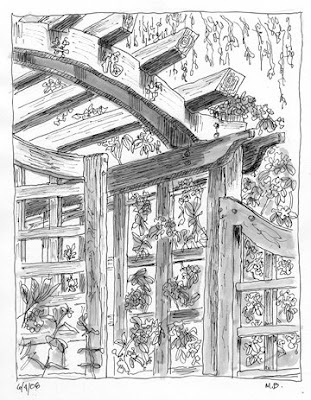 I chose to sketch this arbor because I like the shapes and it was a rainy day so painting was not going to be much fun. 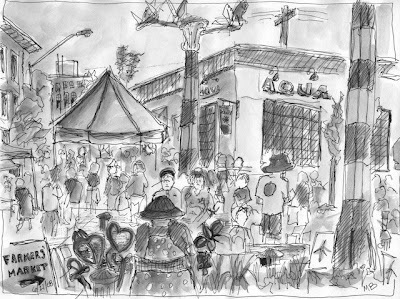 I used my favorite pen, a Pilot P-500 along with a water brush containing water and a drop of ink. I also sketched an old tractor which I plan on turning into a watercolor painting later. 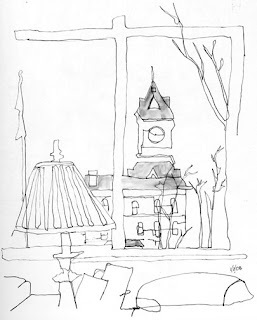 This is our local courthouse which I drew from the library window a few months ago. 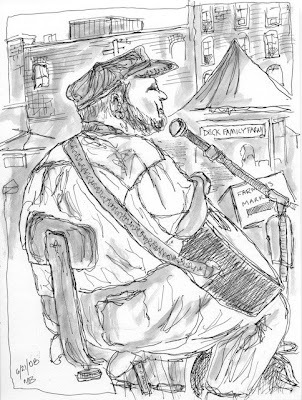 It was a Wednesday, the day and place that a number of us here met weekly to paint or sketch in the winter. 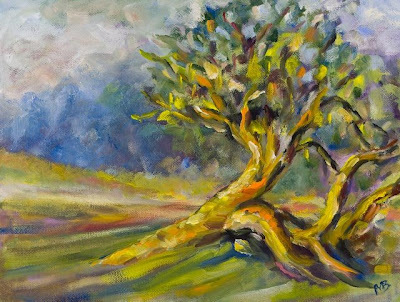 In the summer we meet at various local sites to paint outdoors as part of "Vistas & Vineyards", a local group of about 150 artists. Recently I have been using this style of ink and wash. I also do oil and watercolor. My web site is creativedialog.com . So far this is just a test post. More stuff to come.